Like any terrier, the Australian Terrier is spunky, witted and charming. This breed is feisty, dutiful and friendly. The Australian Terrier is a courageous breed that is always alert and on call. With a spirited and self-confident attitude, they remain affectionate with their families but wary of strangers. Even though they are not completely friendly with strangers, they do get along well with other children and other pets. They do best with older children. Australian Terriers are relatively easy in terms of grooming. Their coat is easy to care for and only requires brushing a couple of times a week to stimulate the natural oils that give the coat a high gloss. These dogs should only be bathed when necessary. Australian Terriers are known to be prone to several different health concerns. These may include suffering from dislocated kneecaps, skin problems, deterioration of the hip joint, diabetes milletus and cancer. They are also sensitive to eye and ear problems. Aussies require minimal exercise to stay healthy and happy. They enjoy daily walks and roaming free in a fenced yard. 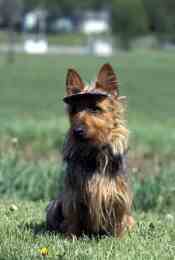 The intelligence of this breed makes the Australian Terrier easy to train for both competition and obedience. Investing in training can also simply result in a well-mannered pet.